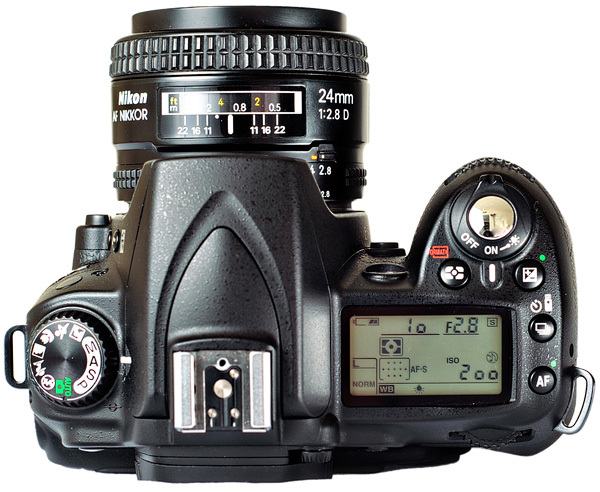 Nikon's 24mm f/2.8 AF-D was introduced in 1994. Although it is an older prime, it packs good performance. It is lightweight, small, and great for low-light! Its build quality is solid, metal internals. 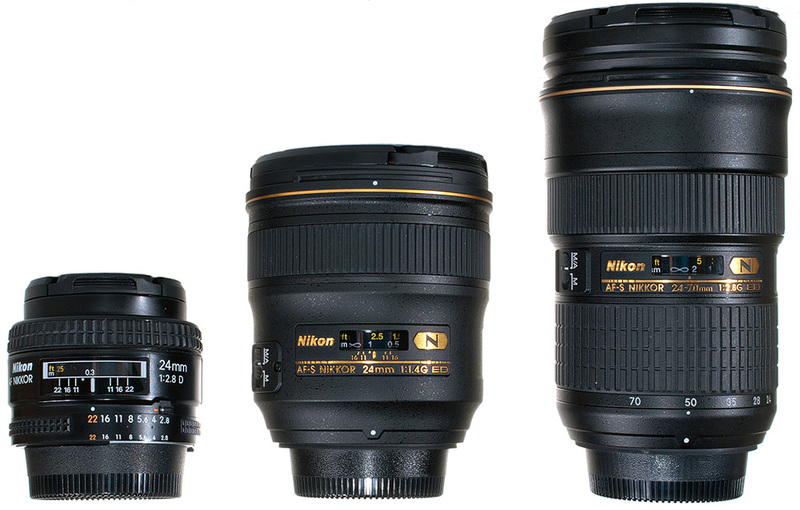 The 24mm performance rivals that of expensive Nikon alternatives such as the 24-70mm f/2.8 G, 16-35mm f/4, 14-24mm f/2.8 and the 24mm f/1.4 AF-S.
For DX one should consider the 35mm f/1.8. However, the 35mm field of view on DX is equivalent to a standard perspective and is not considered wide-angle. Put this on a D90 or D7000 and you got yourself a great compact package. I usually seperate the lens from my D90 for transport. I often take it to night clubs, bars, or parties. I put the D90 body in one pocket, 24mm and a SB-600 flash in another. Worked great using remote off camera flash or bouncing off the ceiling! For cameras which dont have the built in autofocus motor such as the D40, D5100 and D3100, I do not recommend this lens. Such cameras cannot autofocus unless the lens is marked AF-S. I would stick with a 35mm f/1.8 or 18-55 VR instead. This lens is great for its portability and low light advantage. Use it to walk around, take out with friends, or bring to events. Fixed focal length lenses (non-zoom) are great to learn with, allowing one to study the perspective. In this case, the 24mm is a fairly wide perspective on FX and moderate on DX. Usually you want to get close to your subject with wide-angle lenses. However with people, it works great for full body shots. Learn more about Perspective. The 24mm f/2.8D is fixed focal length, you may miss opportunities. It lacks the modern autofocus "AF-S" with manual overide. It is not as sharp in the corners as is the 24-70mm f/2.8G AF-S and the super sharp 24mm f/1.4G AF-S. It has poor bokeh and complex distortion. The 24mm 2.8 AF-D is sharp in the center wide open at f/2.8. The corners are somewhat soft, but sharpen up around f/5.6. Stopping down doesn't improve center sharpness much. The lens is optimally sharp at f/5.6. The example below shows the lens at f/2.8 and at f/5.6. The softness is attributed to the shallow depth of field. The plot on the left is the modulation transfer function plot published by Nikon. Clearly it shows how sharp this lens is at the center at f/2.8. Towards the corners it becomes pretty soft. 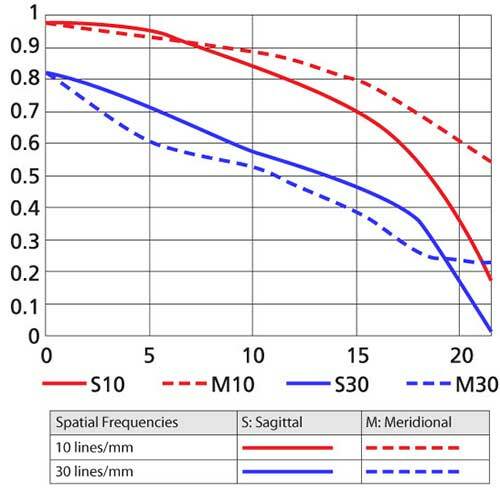 MTF Measurements describe only a sub set of overall lens performance and should be used cautiously. Learn more about MTF. Again, this is another weak attribute of this lens. It has some complex barrel distortion, which means it isn't easily corrected. To correct for this distortion, use +3 in lightroom or photoshop. Learn more about distortion. There is some light fall off on FX. It is gone by f/4. DX has no issues. The 24mm 2.8 AF-D has a good amount of flare when pointed at the sun. This is expected from a lens that was designed in the film days. Digital is much more susceptible to internal reflections which cause flare. Below are some samples which demonstrate flare from 3 different lenses all taken at the same exposure f/11 at 1/500s. The same processing techniques (white balance, fill, color saturation) were identical among the examples. The 24mm f/1.4 exhibited hardly any flare and had the best sunstars. 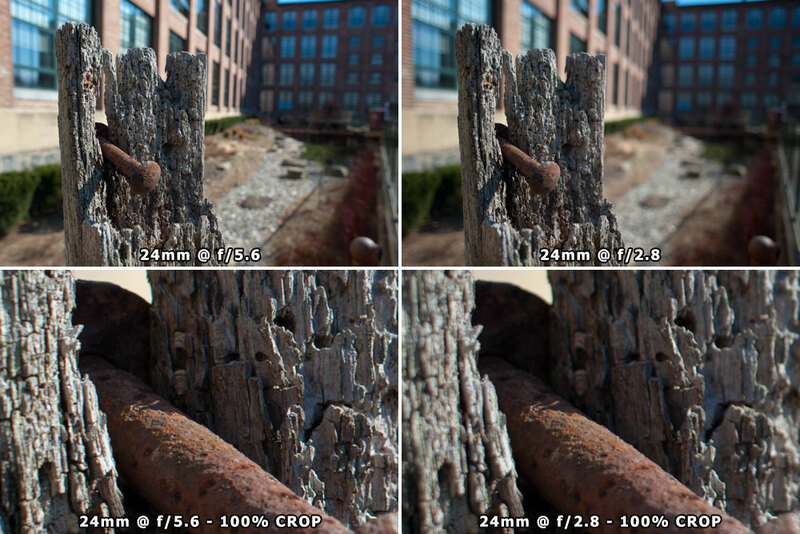 The 24mm f/2.8 AF-D had the worst flare out of the 3. Bokeh is the quality of the out of focus area of an image. This lens has poor or busy bokeh. You can see the Bokeh in the example below. I show the 24mm f/1.4G AF-S and the 24-70mm f/2.8 AF-S as a comparison. Becasue the maximum reproduction ration of the 24-70mm is less, it was difficult to produce bokeh at 24mm. You can see that the snapple cap is not in focus, this was done to show the equal out of focus bokeh of the candle jar. Learn more about Bokeh. The focus ring is a hard plastic with some rubber material grip. 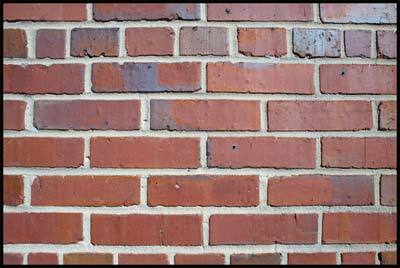 It is fairly smooth and moves easily without much displacement, only a quarter turn and your at infinity from 30cm. No external parts move when focusing except for the front element which moves slightly in and out. For use on older film cameras, it has a plastic aperture ring. For most newer cameras, set it to 22, the minimum aperture, and lock it there using the orange switch. This will allow the camera to control the aperture. Below is the a size comparison of the 24mm f/2.8D AF-D, 24mm f/1.4G AF-S, and the 24-70mm f/2.8G AF-S respectively. Clearly this 24mm f/2.8D is smaller and lighter. It takes the standard 52mm screw on. Do not stack filters, vignetting will occur. The 24mm does not come with a hood. The hood is sold seperately from Nikon: HN-1. The hood is all metal and is a screw on, making it a pain to take on and off. I would use the hood and leave it screwed on at all times. 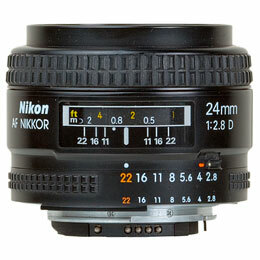 The 24mm 2.8 AF-D utilizes Nikon's close range correction (CRC) allowing this lens to focus as close as 1FT. Although it is not the more modern AF-S, which usually provides faster autofocus, it still has fast auto-focus, faster than the newer 24mm AF-S f/1.4G. It is always dead accurate both on my D700 and D90. The 24mm f/2.8 AF-D lacks a focus switch. Which means you can only turn to manual focus using the switch on the camera body. 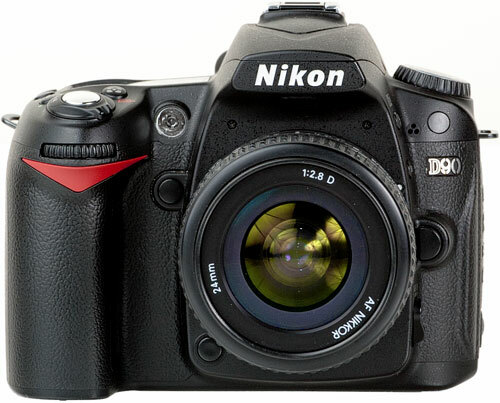 Auto-focus can not be overridden by grabbing the focus ring as much modern Nikon lenses provide, using "M/A" mode. It is classified as a 'D' lens which allows the camera to interpret distance for metering, achieving greater meter accuracy when using flash. 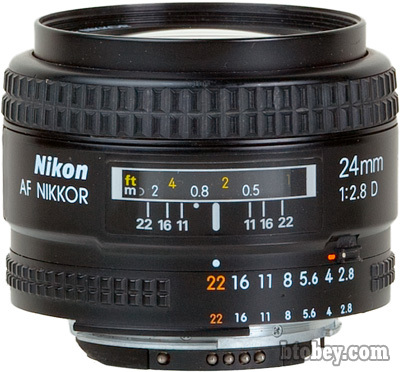 I suggest purchasing the Nikon 24mm f/2.8 AF D used from eBay. To the right is the latest current eBay auctions. This lens usually sells significantly lower than the brand new price. I would pay attention to the serial number and look for a more recent version. Don't buy a used old one because it is difficult to determine haze, fungus, and artifacts which you cannot see merely by just inspecting the eBay pictures. If you are considering buying new, I would buy online from either Amazon or Adorama. I recommend this lens for portable, low light use. It's light, small, fast and optically a great performer, at least in the center. The newer, larger, 24mm f/1.4G AF-S does provide two additional stops of more light, allowing you to shoot 4 times faster. However it is 8 times more expensive, heavier and less portable. For DX cameras which offer an autofocus motor, this lens is a great match. It fits great on a D90. I use mine if I go out to dinner, or to a party or club. It allows great low light capability at a wide angle. Sure cheaper DX zoom lenses usually operate at f/3.5 at wider angles, but usually by 24mm their minimum apature is f/4. This 24mm will be sharper with less light fall off at its f/2.8 apature than the cheaper lenses at f/4.